The crash happened where black ice had formed on I-95 in Smyrna. SMYRNA — A Maine state trooper and a 19-year-old woman required treatment after a pickup truck lost control on black ice and crashed into the woman’s car, which had already skidded off the road. Police say Jayde McNinch of Littleton lost control of her car on Interstate 95 in Smyrna and skidded into the median Monday night. While Trooper Jill Monahan investigated, a truck operated by 37-year-old Eric Clark of Houlton skidded on the ice and crashed into McNinch’s car, which then struck Monahan and knocked her to the ground. A Maine state trooper and a motorist escaped serious injury when a pickup truck hit a patch of ice and struck this car, which had already skidded off I-95 in Smyrna. 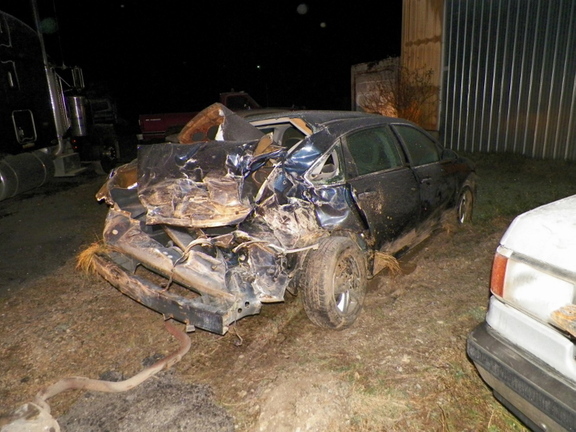 Officials say Clark’s truck crashed into a tree, but he wasn’t injured.